For the production of "Snow White" (1938), the Disney artists had gone to great lengths in order to properly portray the manner in which young women move; these efforts were rewarded at the box-office to such a high degree that the same devotion was applied to the study of deer anatomy in their efforts to create "Bambi" (1942). "We had to remember, that Disney has a ruthless fidelity to the physical scene, to the truth of nature, even when he may seem to be distorting nature." Click here to read more articles about Disney animation. � "He employed 569 people who worked all day and frequently all night to finish it." � "The film took three and half years to make and cost $1,500,000.00". � "He concocted 1500 different paints to give it unmatched color." � "He spent $70,000.00 developing a brand new camera to give it depth." � "He threw away four times the drawings he made and the film he shot." � "He made over 2,000,000 separate drawings..."
Although Disney's wife, Lilian, was said to have remarked, "No one's ever gonna pay a dime to see a dwarf picture", the movie generated more box office receipts than any other film in 1938. "You know everyone in Hollywood?" they asked. I blushed modestly and admitted that I did. "Don't you want to know about the stars? I went on. "Shall I tell you about Garbo?" 'Garbo? Yes, we like her. But the star we 'd love to know everything about is - Mickey Mouse!'" "By 1930, the Walt Disney studio had grown in fantastic fashion. Instead of the 25 employees of 1929, there were now 40 people...By the end of the year there were 66 employees...In 1931 the total number of personnel had jumped to 106...When 'The Three Little Pigs' came along in 1933, the studio had grown 1,600 square feet of floor space in 1929, to 20,000 square feet. A hundred and fifty people were now turning out the Disney productions... In 1937, all the employees were still jostling each other... From around 600 employees in the summer of 1937, the organization had grown to almost 900 by the winter of 1938." The attached article was first seen during a time when a "Palm Award", granted by the editors of "Stage Magazine", was a reliable form of social currency and would actually serve the highly favored recipients in such a grand manner as to allow them brief respites at dining tables found at swank watering holes as New York's Twenty-One Club and El Morocco. Today, a "Palm Award", plus four dollars, will get you a medium-sized cappuccino at Starbucks. 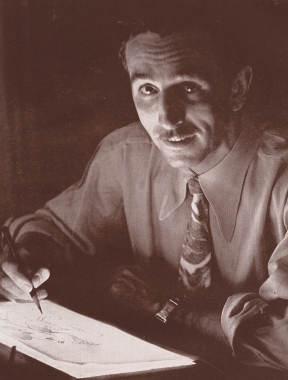 Walt Disney was awarded a "Palm" in 1938 for his achievement in producing "Snow White and the Seven Dwarfs". Seven years after his film debut in Steamboat Willie, Mickey Mouse continued to pack the theaters of the world. Prior to the release of Disney's animated film,"William Tell", STAGE MAGAZINE correspondent Katherine Best was rightfully in awe over the world-wide popularity the rodent was enjoying and at the time this essay appeared in print, he had already been seen in over sixty cartoons.